Explanatory of the Principles and Practices by which, in Peace, with Truth, Honesty, andS Simplicity, the New Existence of Man upon the Earth May be Easily and Speedily Commenced. London, England. Publisher: E. Wilson. Editor: Robert Owen, editor and publisher. 1/1, March 22, 1856-June 21, 1858. 16 numbers with 2 supplements. 6d. an issue, 36 pp. 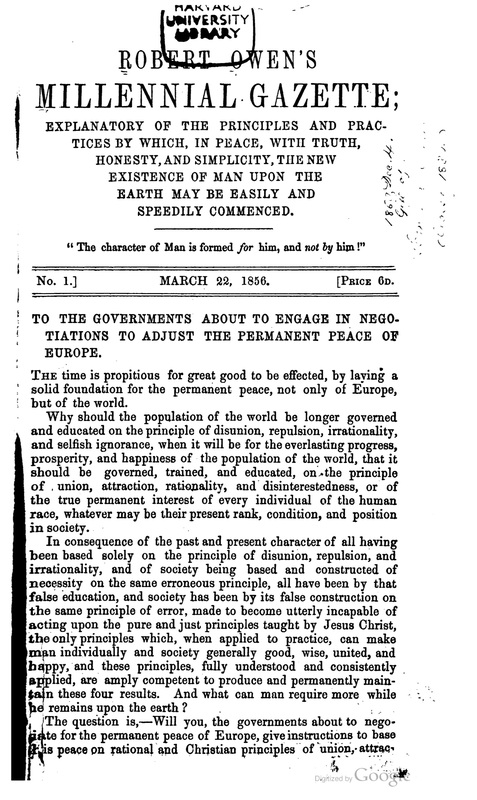 This was another attempt by Owen to spread the word of the coming new existence of man upon the earth, an era brought about by man’s innate spiritual nature and the “advanced spirits in the higher spheres of the spirit world [who] are now most actively engaged in preparing men’s minds for this great and all-glorious change, when old things shall pass away and all become new.” Harvard University; University of Wisconsin; University of Minnesota; etc.